We were in Bakersfield, CA visiting family and we had a couple weeks to kill before our next obligation. The Sierra’s were covered in snow so visiting Sequoia National Park (or the National Forest) wasn’t an option. We considered heading southwest through Ojai and ending on the beach in Ventura, but our next life will be all beach towns and ocean views. 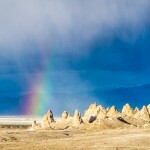 Then I saw a little dot a couple of hours east called Trona Pinnacles. The name sounded interesting and the images on Google looked amazing! Plus, we won’t likely see much desert while we’re sailing around later this year…so we packed up the RV, kissed the family goodbye and convinced a couple friends, John & Peter (The RV Geeks), to come along on the adventure. We came out with a plan to get some work done on the computers and hike as much as possible. “We’re not going to shoot a video here; we just won’t have the time to edit it” we kept saying. Well, this place was way too beautiful not to share…we simply couldn’t help ourselves. Oh and even more important, remember my Top Camera Gear post and that Drone I’ve never put to good use? We decided Trona would be its video debut. What did you think? 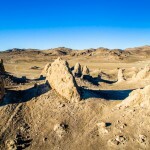 I thought it wasn’t half bad for our first drone video and Trona turned out to be the perfect location to fly. There is a huge parking area near the pit toilet and what we might refer to as the ‘entrance’ to the pinnacles. We camped here with Peter and John the first few nights because it was easy. Once we explored we ended up moving to the location in the video. All-in-all I think we saw a total of 5 or 6 campers the entire 14 days, so needless to say there were plenty of places to park in solitude (especially if you have 4wd). We hiked almost every day. We’d point to a pinnacle in the distance and just start walking. Within our 14 days I think we visited all the main areas where the pinnacles are visible. It’s lots of scrambling so if you plan to hike make sure you have sturdy hiking boots. Seriously each sunset was completely different than the evening before. Some days we’d scramble up on top of a hill, and others we’d stay down in the valleys. There’s no better way to end a day than watching a kaleidoscope of colors fill the sky while sippin’ on a sundowner. One evening after 12 days of being out in the wild we decided to clean up and head into town. “There’s gotta be a watering hole where we can have a drink with some locals.” we said. Turns out we only saw 2 restaurants total in the entire Searles Valley. So we went back to our tufa for stargazing and a hand crafted old fashioned. Plus, we just couldn’t get enough of this incredible night sky. Even when the clouds would roll in they couldn’t hide the stars out here. If you’re wondering why we chose this location as our quad-copter debut, here’s the story and our little case of FOMO. As we were driving in toward the BLM Peter pulls over and says “I gotta get this on the drone!” He hops out of the Motorhome and proceeds to flaunt his new found quad-copter prowess by capturing a “follow-me orbit” with his drone. Throughout our few days with the RV Geeks they eagerly flew their drone all over the place. At one point I remember saying on a few of the flights “He’s CRAZY!” Their eagerness to fly gave me the courage to pull out our drone, charge the batteries, download the updates and get it in the air too. Here is the video the RV Geeks put together in Trona…and yes we were there just before the release of Star Wars: The Force Awakens so we were a little giddy with excitement. After 14 days in the wild we were running pretty low on everything…including clean underwear. So, we headed for Ridgecrest and the Desert Empire Fairgrounds. It wasn’t pretty but it only takes us one day to do all of our laundry, dump and fill the tanks and pick up a few groceries. Roads – If you’ve read elsewhere the road is horrendous, for us that wasn’t the case. I wouldn’t call it a great road but it didn’t destroy our RV or knock dishes out of the cabinets. We took it slow and the 5.5 mile trip from the highway to our campsite took about 45 minutes. Cell Phone – Rock Solid Verizon 4g, we were able to stream video, upload, etc. Weather – Summer is hotter than Hades. Spring, Fall and Winter can go from warm and sunny to chilly, windy, and even super crazy windy (you may have noticed a bunch of debris at the end of the video within the sunset timelapse). It even rained two of the days we were there, I think we might have broken the precipitation record for the day! Fuel – Fuel was cheapest in Bakersfield at the Costco, and this particular Costco had Gas, Diesel and Propane…so fill her up! What did you think of the drone videos? 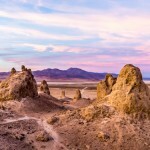 Have you visited the East Side of the Sierra Nevada Mountains? 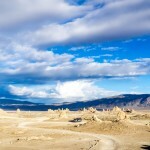 How about Trona? Share your favorite southern California wild camping stories in the comments below. If you have any questions ask away, we’ll do our best to direct you in a proper direction. Hi Phil. Please don’t. Gone With the Wynns content is copyrighted, and having it appear in more than one place will hurt both sites as Google doesn’t look favorably on duplicate content. You are welcome to mention the Trona video and link directly to it on GWTW, but you may not copy it. Thanks for understanding. 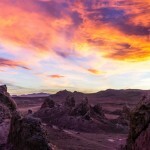 Really enjoyed your fly by video of the Trona Pinnacles. I am just about to leave my stay in Quartzsite and I am NOT ready to get back to WA (AKA home) just yet. I was going to look for some new spots in the SW. I will be there next week, thanks for the introduction. I was already headed to the Ridgecrest area anyway. I have been know to spend some time at Dove Springs OHV riding area. 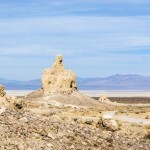 It is a big time off road playground just about 25 miles SW of Ridgecrest and just north of Red Rock Canyon State Park. I have a few questions about the quad copter. It seemed to have a long range as shown by the approach shot of your camp from, how far away? Another point is there were a couple of shots of the 4 of you walking together in the desert and also the two motor homes driving down the dirt road. Who was the pilot, or can the copter be set on an automatic flight path? I have not yet had a chance to “play” with such a device but I have done a little (very little) research on them. So lastly, is your copter carrying a GoPro or does it have another sort of camera attached? Thanks for another great production. I hope to bump into you folks on the road sometime. I enjoy showing off the travel trailer that I just built (well, almost finished, do they ever get completely finished?) inside a cargo trailer. How were you guys able to make your water tank last 14 days? Do you ever bring extra water? If you go back, dropping by what used to be called “Searles Chemical” plant (may have changed) is worthwhile. Main office in Trona. They have (or used to when I worked for the parent company) an annual field day where they let people out on the lake bed and collect minerals. The water table under the dry Searles Lake has, as I understand it, every mineral known and you can collect some pretty awesome crystals. There is also a small community library in Ridgecrest. Liked your comment about the nightlife: yeah, from Westend, Argus to Trona the only worthwhile restaurant used to be the Wild Rose. 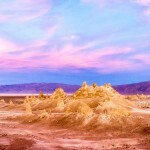 My questions for you – The dirt road to get to Trona was pretty bad for an RV towing a Jeep. 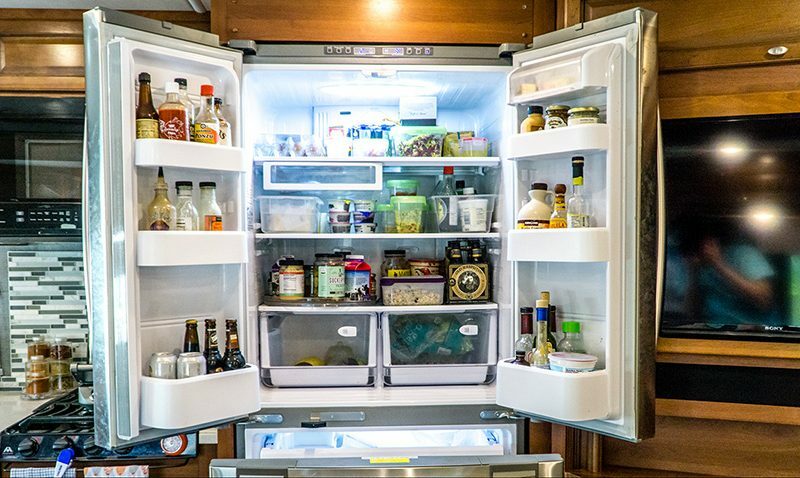 Is this pretty typical of BLM stays? Just trying to know what I’ll be getting into. I saw on another video to drive your toad in first and choose a spot then drive the RV in, which sounds very smart. Also, to note, AT&T didn’t work here at all. So I think I’ll get a VZW sim for my iPad and keep AT&T for my phone and maybe have a better shot at getting service when wild camping. Thanks for posting so many great videos!! That was amazing! Thank you so much for taking the time to video this. Someday we will visit this place too. We loved it so much we couldn’t leave without sharing. You need to look at a Greenline boat. It is a hybrid with solar power! OK, how do you NOT loose your cats? 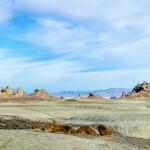 We just Trona Pinnacles yesterday. I thought I would see if y’all had ever been there, and alas, you have. Great drone footage! We didn’t camp there, we were staying at the Family Camp on the China Lake Naval Base (if any of your readers are active or retired military, couldn’t recommend it more! Big, wide spots, everything is in pristine condition and full hookups for $15 a day). We weren’t allowed to have a campfire on the base, so we packed up and spent a few hours in the evening at Pinnacles, cooking out and enjoying a fire under the stars. The next day we went back for some hiking and exploring. There were a few campers (1 RV, a couple of tents), lots and lots of hikers and lots of dirt bikers and ATVs. This was President’s Day weekend, so that was to be expected. The sunsets are A*M*A*Z*I*N*G. We were so happy to discover this gem of a place. Thanks for sharing your amazing drone footage. I just bought an old RV I’m remodeling and love watching your videos. Quite inspiring. I look forward to the adventures we both have! Love your video!! I was born and raised in Trona. If you ever venture back out, you have to have dinner at the Trails Drive In. The pastrami double cheeseburger and peanut butter shake is to die for!! The sun tea is pretty amazing too!! Thanks again for the video, the sky is amazing at night. Great drone video, would never had guessed it was your first! Excellent drone video. I would have never guessed it was your first! Jason you and Nikki have convinced me that RVing is a great way to live life. I’ve really enjoyed your site about your travels. I’ve been thinking about seeing more of this beautiful country but life keeps getting in the way. I’ve started my search for an RV and hopefully in the near future I’ll be on the road. The one problem is my lovely bride is against it. Oh well, I’ll miss her. Good luck in your sailing adventures. I look forward to hearing about it. So want to be there! Drone footage was great and love the time laps. I often see that one can spend up to 14 days boon docking, however I don’t know how long before you can come back, or how far do you have to move away? Fantastic photos and drone video! I definitely want to make a stop on our way North now. And Brandon has had FOMO since drones came out. He’s decided all his birthday money should be going towards one and I think this will help put the nail in the coffin. Sorry, we missed you guys, we hope we’ll see you in port someday! Everything you two do is spot on, beautiful work. I’ve been itching to do the drone thing, so thank you for making the itch worse. Loved it! 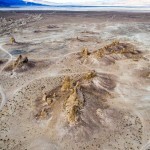 Great drone footage…Can’t wait to try some BLM / wild camping adventures. Great post & video!!! I was waiting for this one, Nikki had replied to me last month that you’d post this sometime in January….you juuuust made it 🙂 haha!! My husband and I spent Thanksgiving week there, I think we may have been in the same spot you guys moved to! 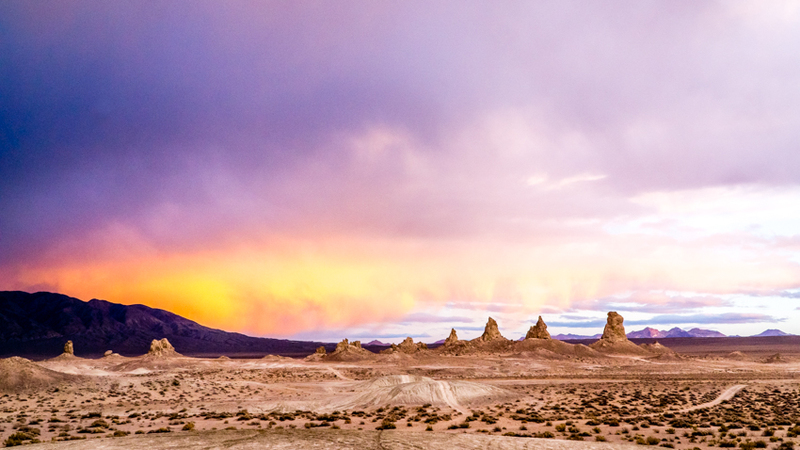 Trona is one of our new favorite boondocking spots! Can’t wait to go back! Looking forward to your sea adventures this year, safe travels! Your drone video was wonderful. And thank you for sharing a place I probably never would have found on my own. I’ve added it to my growing list of beautiful and intriguing places to explore and camp thanks for the Wynn’s. Are you sure you have to leave dry land??? Awesome! Good to hear the road is again in good shape – it has been gawd awful! As others have I also recommend the 20 Lakes Basin and it has a side trip to the glacier. Bring bug spray! Another great hike is Lundy Canyon, altho possible to drop into the canyon from the 20 lakes basin, go up the canyon from Mono Lake via Lundy Lake. Always enjoy your blog! Awesome! Did I say awesome? Spectacular night shots but loved them all. Two of my favorite couples out there having a ball. Jason great job with your drone and all the videos as always, I just wanted to watch more. Oh almost forgot, it was so cute when the kitty followed you up the rock. Safe and happy travels. 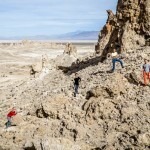 So love Trona Pinnacles, and so glad you guys got to experience it for an extended stay. Wonderful captures of an amazing place! Thanks Cherie. After I found this place I thought “I bet wheeling it has been there”…and low and behold you guys got to go with them! It’s always fun to meet up in the middle of nowhere, especially when it’s completely unplanned. Hope to see you in FL. Love your “video from the sky”! More, more, more! I’d love to get one! I can’t wait to see your boat from the sky!!! BTW, I just got done with a Livestream with Becky of Interstellar Orchard & Cherie and Chris of Technomadia. It was fantastic hearing them talk in real time. Have you every thought of having one? I think it would be fantastic! What cha think? 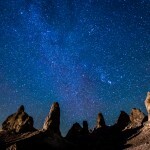 Always wanted to go out to the Trona Pinnacles. I always remember them in the summer when it is a bazillion degrees out there. Nice story. You mentioned the Eastern Sierras. If you are heading towards the Eastern Sierras, it is really pretty this time of year, but most of best parts are under about five or more feet of snow at this time of year. 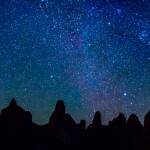 But if you are there June thru summer, I would take a trip up to the White Mountains (the mountain range that is on east side of the Owens Valley) and the Bristlecone Pine Forest. I know folks who like to camp off road out there and not see anyone else for a couple weeks! Further up the Owens Valley, the drive up to Horseshoe Meadows has a view that goes on forever (about 4000 or 5000 feet) above Owens Lake. 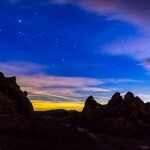 Further up the Owens Valley are the Alabama Hills where countless Westerns and SiFi movies have been filmed. If you want to experience some backcountry wilderness hiking day hike style, I would go up to the Rock Creek and hike the Little Lakes basin. Or drive further up the eastern Sierras, go to Saddlebag Lake, take the water taxi across the lake and then hike the 20 Lakes Loop (20 lakes in 10 miles, all above 10,000 feet). Some of the prettiest country you’ll find anywhere. Thanks for the tips Eric, we love the Sierra’s and have spent a bit of time there (although we haven’t written about much of it). Once again you all rock. Ya find the most beautiful places. Beautiful!! Love the drone video. Good job on the drone flying, enjoyed the video. You did a much better job then I did at my first attempt. I shot some video while in Quartzstie, the fist video was one second long…………not much to see…………the second video I shot was twice as good……it was two seconds long…………..I think something is wrong, either with the drone or the operator. My drone is a cheapy one, and I’m already considering upgrading…….meanwhile, Steven Spielberg has nothing to worry about, at least from my videos. Haha, yea this was the first time we really got it out for longer than a few minutes. The wide open space and interesting landscape provided lots of room to play. I prefer our DJI because everything is built into the drone and I can control everything (including camera settings) from my phone app. You mentioned sand storm, have you been in one of the crazy ones? What was it like and how did you deal with it? We’ve been in a dust storm in Burning Man and it was fine, its one way to find out where all the “holes” are in an RV. Hope you guys have an FAA license to fly those drones because there’s been some pretty heavy fines handed out recently. Great footage though! Love the videos; great editing. Love the photos; excellent post work. Great video as always from both of/all of you. Can’t wait to get out west this year and get there. I am really hoping our cat Cadbury will be trooping along with us off leash by then. BTW guys, I would love to go home to STX and show you around and hey, maybe if you go we’ll take a break and fly down while you’re there and do so but…there are lots of good people and many who will be more than ready to show you around. Please keep in touch…meeting you there, or anywhere, would be a treat! The drone vids were awesome… Really accentuated the otherworldliness beauty. 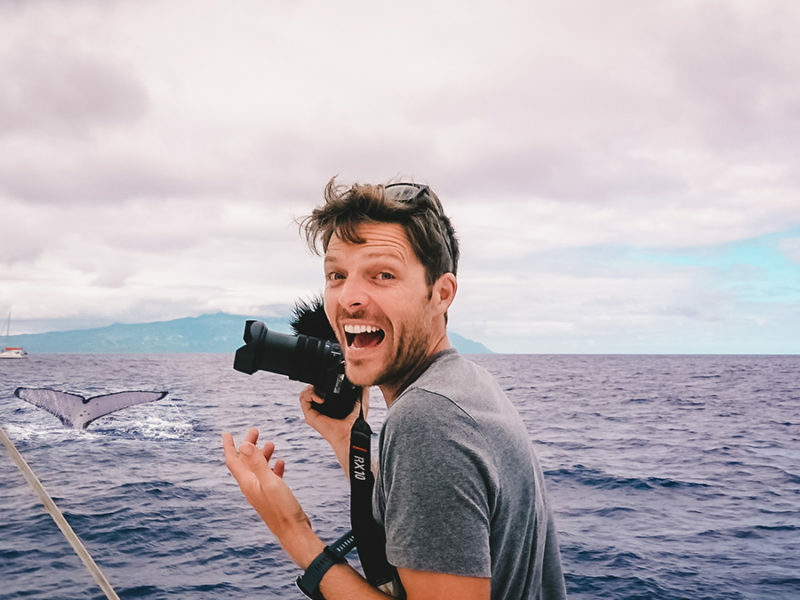 What kind of drone to you have and how much practice to get those awesome vids?Think you’ll be brave enough to use the drone when you are sailing? We are new RV owners and I have to resist the urge every day to quit my job and head off into the wild blue yonder! If you’re somewhere safe and wide open it’s easy to fly a drone like ours. HEY … so how did you do all the aerial photography when all four of you were doing the light saber battle? Can the drone do FLY BYS … hehee And you’ve got both RV’s going down the road, then the drone comes up from behind and does a FLY OVER to boot. You’ve got one really smart drone, me thunks. What’s the secret, fess up guys? The new software built into the drones are amazing! Both the DJI that we have and the RV Geeks 3DR. We used two different Solo “Smart Shots” in our video: One is called “Follow Me – Orbit” and once the shot is set up, the drone circles the controller’s position, even when the controller is moving around. That’s how we got the footage of the RVs driving down the road. The altitude and radius can even be adjusted manually during the shot to pull up and away. The lightsaber battle, and also the shot of us all walking toward the camera between the RVs, was shot using the “Cablecam” smart shot. You set two points in space, and it flies autonomously between them. Just press the start button, and it flies to the other end by itself. 3D Robotics just announced that this spring will bring a software update that will include multi-point cablecam shots, so we’ll be able to set unlimited points in space, and let it fly the whole route automatically. Jason’s Phantom already has that feature. It’s amazing what these things can do. Another unusual piece of this great country that most have never seen or heard of. 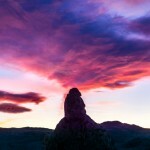 The Southwest has so many unique formations. Another thing that I like about this area is the night sky. 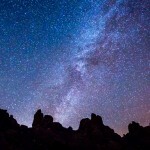 Most of the places where we live and camp have light pollution and we can’t see the night sky in all of its glory. Thanks for capturing that for all of your followers to see. The drone adds another dimension to your post. I hope that you fly the bird when you can. You mentioned the “boat” again. Is there an update that I missed? Thanks again for sharing. Happy Birthday Jason. I know I am late in writing this. I hope you had a good one. You said you where looking for a sail boat. Here’s a idea. I use to own a Mac Greger 26 X sail boat. It has a out board and its on a Trialor. It can sleep six also self righting,self bailing, can two a like water skier and has a water balance so it light to tow with a 6 cyl. Nice thing is you can driving will call you back it up on a beach and don’t have to pay for moreage. I towed mine to lakes all over and even in Arizona found people using it as a RV when on land. It can handle small craft warnings and is easy to driving will call you back with its helm wheel. Some times better then a bigger boat with more cost. Let me know what you think. The photographs don’t even look real! They are beautiful and so different that anything I have seen you shoot. I enjoyed the Geeks video. It was an unusual landscape to say the least! Looks like a great time, we love Boondocking and doing it in such a magical place is icing on the cake. We got to get a drone for the wonderful videos of course, but also for my light weight portable ham radio simplex repeater which will let us communicate with our adventurous hiking family members when they choose to make “line of sight” a little longer distance. Aliens don’t need our primitive radio technology to communicate with us, but I used to reflect my signals off the ionized trails of meteors to contact rare grid squares across North America, so there are a lot of ways to enjoy stargazing, LOL. Whoa, that sounds neat. The sky is so fascinating. Ha, the RVGeeks beat me. Both videos were great. Thanks to the both teams for all you do! So we’re gonna go ahead and be the first to comment here, and say what a really wonderful time we had with you two. A great location and great friends is indeed the epitome of the RV lifestyle. Thank you both so much for sharing. 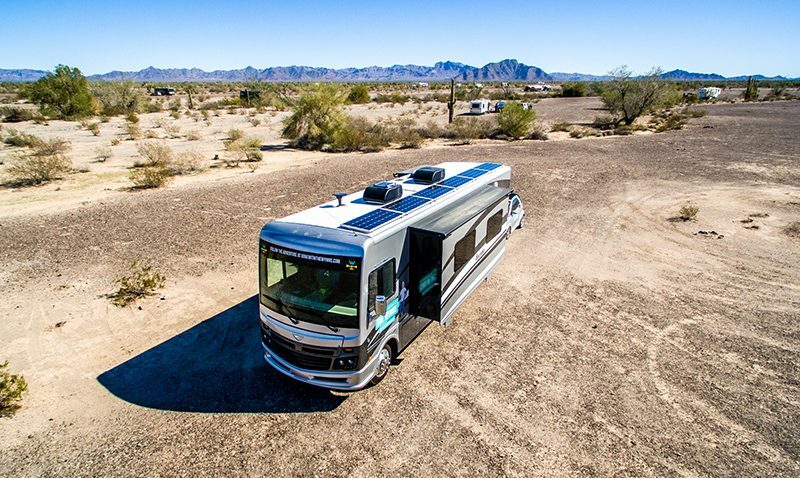 Off Grid Solar Powered RV Air Conditioning – Is it Possible?